Randy Sexton Talks About Moves Expected in Free Agency · Let's Go Amerks! It’s July 1st which means today is the first day of free agency and time for gaps in the Rochester Americans roster to be filled in. The team has two specific needs – a goalie and a forward or two that can score. 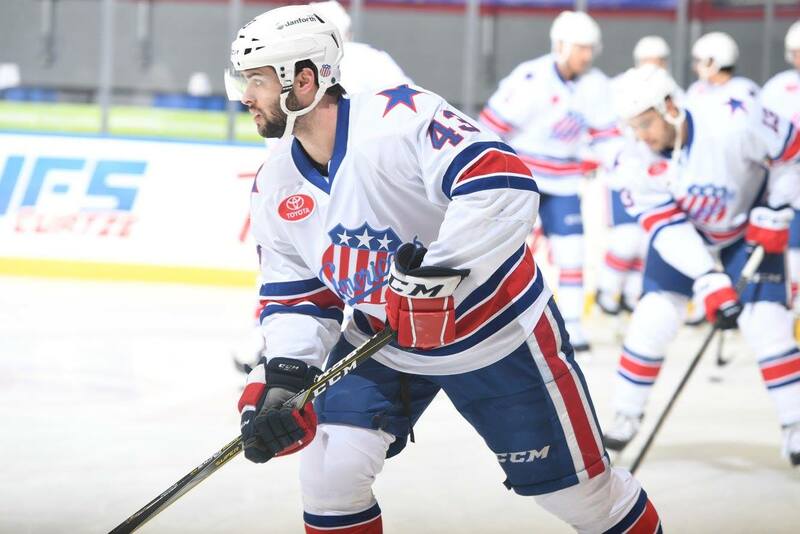 Leading up to the start of free agency the Amerks have already signed Zach Redmond to a two year AHL contract along with one year deals for Adam Wilcox, Andrew MacWilliam, Nathan Paetsch, Dalton Smith and Arvin Atwal. Players can sign American Hockey League contracts with the team they finished the season with but any new player signings have to wait until July 1st. Adam Wilcox will be returning as the second goalie in Rochester. Last season he appeared in 29 games and finished the season with a 2.79 GAA and .903 save percentage with a record of 12-7-5-2. Michael Hutchinson, Tom McCollum and Mike McKenna lead the way as the top three goalies that will be looking for playing time in the AHL. Mike McKenna could be a tough sell at this stage in his career for a position in the NHL if needed but two straight appearances in the Calder Cup finals with two different teams is a sign that he can carry a team. Linus Ullmark was an AHL All-Star and was the key piece of the Amerks success in the first half of the 2107/2018 season. A starting goalie in Rochester should also be expected to be the third goalie in the Buffalo Sabres depth chart if when a call up is needed. There’s only one other goalie in the organization on an NHL contract besides Ullmark heading into free agency and that is Jonas Johansson. The plan is for him to play in Cincinnati again. Three of the top 10 scorers may not be back in the upcoming season. Colin Blackwell (17G+28A) being the top name on the list. The other two players are Seth Griffith (15G+26A) and Sahir Gill (18G+21A). Colin Blackwell lead all the forwards in points last season with 45. He was only two points behind defenseman Zach Redmond for the team lead. A possible hold up is whether or not a two way NHL contract has been a part of those talks. If that’s the case you can’t blame Blackwell and his agent for shopping around to see who would be willing to offer him one. Scoring goals was an area that team had struggles with throughout the season. They plan to address this in free agency with one to two players. The scoring was balanced across the roster but too inconsistent. A challenge that’ll be faced is finding a scorer that will not be in the veteran category unless other moves are made. Olofsson and Asplund show signs of being successful North American hockey players but until they start playing the game over here there’ll be a level of uncertainty. AHL teams are only allowed to dress five skaters that have played 320 or more professional games and one exempt veteran that has played more than 260 games but less than 320. Andrew MacWilliam and Dalton Smith are in the exempt category with less than 320 games. Current veterans on the team with over 320 games will be Kevin Porter, Zach Redmon, Taylor Fedun, Matt Tennyson and Nathan Paetsch. Some leading goal scorers in the AHL last season that are available are Chris Terry (32G+39A), Eric Tangradi (31G+34A), Teemu Pulkkinen (29G+36A), Brandon Pirri (29G+23A) and Austin Czarnik (25G+44A). There’s a long list of names available, those are just some of the top goal scorers from last season. Defensively the team is set with returning defensemen Zach Redmond, Andrew MacWilliam, Taylor Fedun, Matt Tennyson, Nathan Paetsch along with rookies Will Borgen and Lawrence Pilut. There’s also the chance that Brendan Guhle could start the season in Rochester again depending on what the Sabres do this summer. The fact that Brandon Hickey was specifically mentioned above is a likely indication that the Sabres are going to sign him before he becomes a free agent on August 15th. The Buffalo Sabres obtained his rights in the trade that sent Hudson Fasching to the Arizona Coyotes. Mike Sislo was also acquired in that trade but his name hasn’t come up anywhere. Jason Botterill, Randy Sexton and Steve Greeley have an idea of where everyone is slotted to play and then what spots need to be filled in. The need to have a winning season is a top priority again in Rochester to continue growing a winning culture from the bottom up. Updated: That changed. The Buffalo Sabres signed goalie Scott Wedgewood to a one year two-way contract to share net duties with Adam Wilcox. There’s two great lists available of the top free agents looking for AHL jobs. The first list here by Chirps from Center Ice (a WBS Pens blog) and the second here by Patrick Williams. Follow Lets Go Amerks on Twitter for all of the latest updates as they become available. Qualifying Offers and Contract Status of the 2017/2018 Amerks – A complete list of everyone that played in at least one for the Rochester Americans during the 2017/2018 season and their current status.